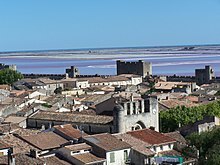 Aigues-Mortes (French for "dead waters") is a city in the south of France. It is in the Languedoc-Roussillon region. It was originally founded by the Romans in the year 102 BC. The first records mentioning it under its current name date from the 10th century. Louis IX of France rebuilt the port in the 13th century. It was the only French port of the Mediterranean at that time. The city is laid out as a bastide. It was the starting point for the Seventh Crusade (1248) and Eighth Crusade (1270). Due to changes of the coastline, the city is several miles from the sea. It is linked to the sea through a canal, nowadays. It has well-preserved city walls. In 1999, about 6.000 people lived there. Aigues-Mortes is about 35 km from Nîmes. This page was last changed on 9 March 2015, at 18:29.